Zithulele Hospital has been featured in a number of different publications over the years. You can follow the links below to find out some more of our stories. They are listed chronologically below, but even now the highlight was probably a feature article on our multidisciplinary team in the Lancet in 2009. So don’t miss this one! Rural Hospital beats the odds in South Africa. Ben Gaunt and Cath Young had an article published in the Southern African Journal of HIV Medicine called Providing high-quality HIV care in a deeply rural setting - the Zithulele experience. Ben and Taryn Gaunt were featured in the South African Medical Journal as Rural Doctors of the Year (read it here). We feature intermittently in the press for various reasons. Here is a reasonably positive story about our efforts to reduce perinatal mortality. Voice of America also ran a series of articles on our team, part one of which can be accessed here and then followed. The year started with profiles of two of our doctors. Dr Thembinkosi Motlhabane was profiled in the Mail & Guardian (read it here) and Dr Liz Gatley in the South African Medical Journal (read it here). Towards the end of the year the Mail & Guardian newspaper ran a series of articles inspired by Zithulele. They profiled our exclusive breastfeeding policy, as well as illustrating the challenges of access, poverty, and the scourge of women being abducted. Dr Elizabeth Gatley was named provincial rural doctor of the year at the 2011 RuDASA Rural Health Conference held in Rhodes Village. The Times newspaper picked up the story, which you can read here, as did the Medical Chronicle, which you can read here. A Place of Quiet Faith. This article in the Winter 2011 of Discovery Magazine (the quarterly publication of South Africa's largest medical aid with over 1m principal members) followed our receipt of a Rural Institutional Award in 2010. Read the article here. 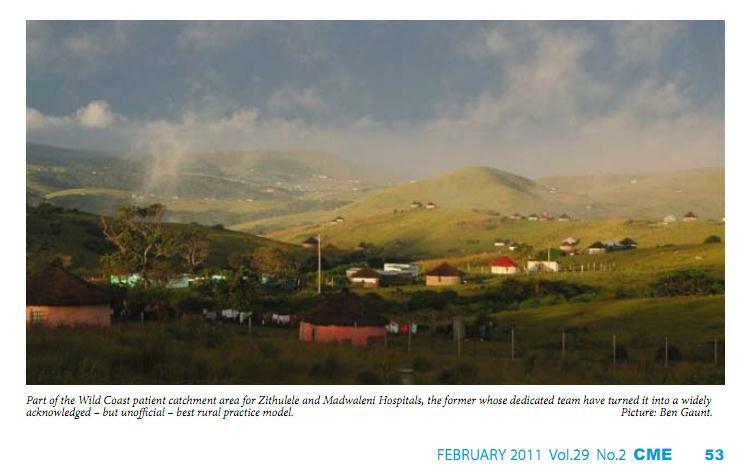 The topic for the February CME journal was Rural Medicine and they used a photo of ours they had in stock, giving it the exciting caption: "Part of the Wild Coast patient catchment area for Zithulele...whose dedicated team have turned it into a widely acknowledged - but unofficial - best rural practice model." Download the screenshot here, or access the full editorial at here. Karen Galloway wrote an article on rural rehabilitation for the physiotherapy magazine Hands On. She asks if everyone is really "designed to be an urban physiotherapist." You can download the article here. The Lancet article, referred to above, was published in 2009. It was a real honour to profiled in one of the world's leading medical journals!